The site of the Es Salam reactor in Algeria, near the town of Ain Oussera, is divided by a fence into two main parts: the “Cold” area and the “Hot” area, where all work with radioactive materials is conducted. The complete reactor site is encompassed by a wall or a fence, with watch towers at the corners of this rectangular area and at points along the fence. Outside this main area, on the other side of the road along the fenced perimeter, there are several additional buildings that are estimated to be part of the administrative/logistical support system. In the following table, some assessment of or guesses at the purpose and utility of the buildings (in a broad sense) will be presented. 1. Gate to reactor site There are gates next to a guard house blocking the incoming and outgoing traffic. There is an additional incoming gate further along the driveway. A fence separating the hot area from the cold area is past the gates. 2. Water tower The water tower has a watch enclosure on top. 3. Possible pump house and associated facility Difficult to assess. Could contain underground water pumps for the water tower (no. 2). 4. Administrative building Location near entrance implies administration role. 5. Reactor The building includes two side portals that could be used to remove irradiated materials or waste products. Possible air filtration or venting on each side of the main reactor hall. 6. Hot Laboratories A main long building, with a side entranceway, and a crane that could be used to load/unload shielded casks for moving high-activity radioactive materials. These casks could be entered through the wide opening or through the roof. There is a covered connection (for people or material) from the reactor building. 7. Auxiliary annex This could be either the final link in the chain of radioactive material production process, or auxiliary analytical laboratories, services etc. 8. Isotope production/ reprocessing and/or waste treatment building. It has a ~60 m exhaust stack This is a newer building than no.12. It has a wide entrance suitable for unloading heavy (shielded) containers. It also has an elevated section at the entrance, which could house a crane for moving the containers. The building is connected by underground pipe/tunnel to a suspected burial site for two storage tanks that could be used for storing high-activity liquid wastes. Near the building there is another overhead crane (similar to that near no. 6). Although the external crane could be used during the operation of the facility, it could also mean that the construction of this facility is still not complete. To the west of the building there is a large cleared area, the purpose of which is unknown. There is another gate exiting the hot area to the north of this building. 9. A building that could be connected to the waste disposal activities of no. 8. 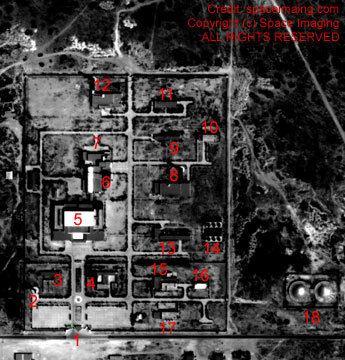 The buildings 9, 10 and 11 are situated in the "hot" area, devoted to high-level-radioactivity work. They could include facilities for decontamination, chemicals’ storage, laboratories and R&D facilities. 12. A) A reprocessing/ waste-treatment facility. It has a ~60m stack connected to it. or B) An air filtration facility, for the reactor and possibly for the Hot labs. A) This facility, which is obviously older than no. 8 is apparently not much used. The entrance (which is not very wide) has vegetation growing on it, and there is not any evidence of any recent activity around it. B) The facility is connected to the Hot labs and the reactor buildings. The lack of activities and obvious entrance for the fuel casks makes it less of a candidate for reprocessing. 13. Possible Water/ electricity control building. Although this building has many windows and could be seen as another administrative building, it could, because of its proximity to the cooling towers and to the reactor, and because of an apparent below ground connection to the reactor building, be controlling all services that are being supplied to the reactor and the other facilities. 14. Six cooling towers If these are being utilized to supply only the reactor, they are over-sized, if we accept the declarations related to the power of the reactor. 15. A) Technical/logistical support building or B) The site’s central dining facility A) This building is within the site boundaries, yet outside the Hot area. The purpose of the building would be in a support role. B) There is no other "natural" choice for such a facility, inside the site, yet in the Cold area. The entrance structure makes it possible. 16. Technical/logistical support building This building is within the site boundaries, yet outside the Hot area. The purpose of the building would be in a support role. 17. Technical/logistical support building This building is within the site boundaries, yet outside the Hot area. The purpose of the building would be in a support role. 18. Double metal domes - partially buried. These could serve as fuel and chemical storage tanks.